Di had a pretty good weekend. She completed her second half-marathon on Saturday morning AND she made a great time - crossing that finish line in under 2 hours and 45 minutes. I walked along with her for 8 of the 13.1 miles for "support". That photo is taken with an iPhone so imagine how close Di had to be to the eagle. This is the second time that Di has sent me an iPhone photo of an eagle at Lemon Hill. The first was a few years ago. She is so lucky. I walk the dog here almost every day for 8 years and have only seen 2 eagles - flying over the river, never perched. You can see the Eagle if you look really hard at the tops of the trees. Don't worry, the traffic was moving so slowly that there was no danger. I didn't look at the phone, I just held my thumb on the shutter button and snapped about 8 photos. Of course, I had to get a better look. 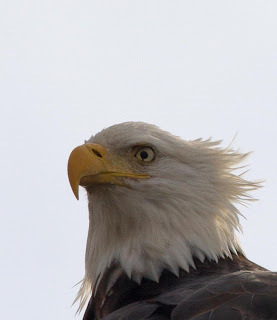 I have been hoping for this situation for years - a photo of a Bald Eagle in the city. It only took me 5 minutes to exit the Schuylkill at Girard and make my way to the gazebo at Lemon Hill where I found Di, Barbara and Sammy waiting for me. I snuck up to the gazebo with my Canon 7D with 400mm lens and snapped about a billion photos. The lighting was terrible but I managed to get a few good ones including this head shot. Check out the dark pigment spot on the eagle's eye. It is supposed to be all pale yellow. Cool. The holy grail of photos still eludes me - a photo of an eagle with the city sky line in the background. Some day, some day. Congrats to Di for a stellar weekend.